Webb County is a county located in the U.S. state of Texas. As of the 2010 census, the population was 250,304. Its county seat is Laredo. The county was named after James Webb, who served as Secretary of the Treasury, Secretary of State, and Attorney General of the Republic of Texas, and later judge of the United States District Court following the admission of Texas to statehood. 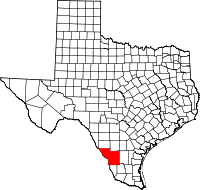 By area, Webb County is the largest county in South Texas and the sixth largest in the state. The Texas tourism travel station is located at the intersection of Interstate 35 and U.S. Route 83 north of Laredo. Webb County includes the Laredo metropolitan area. Webb County was split in 1856. Encinal County was established on February 1, 1856, and was to have consisted of the eastern portion of Webb County. However, Encinal County was never organized and was finally dissolved on March 12, 1899, with its territory returned as part of Webb County. Much of Webb County history is based on the prevalence of ranching in the 19th century and continuing thereafter. The Webb County Heritage Foundation is a nonprofit organization that seeks to preserve documents and artifacts of the past to guarantee that the regional history is not lost to upcoming generations. In 2015, the foundation, headed by President James E. Moore, presented Heritage Awards to such local notables as the artist Janet Krueger, the journalist Maria Eugenia Guerra, and the Laredo Community College art instructor Martha F. Fenstermaker (1943-2014). According to the U.S. Census Bureau, the county has a total area of 3,376 square miles (8,740 km2), of which 3,361 square miles (8,700 km2) is land and 14 square miles (36 km2) (0.4%) is covered by water. The Webb County - City of Laredo Regional Mobility Authority has responsibility for a comprehensive transport system in the region. As of the 2015 Texas Population Estimate Program, the population of the county was 273,536, non-Hispanic whites 8,699 (3.2%). Black Americans 552 (0.2%). Other non-Hispanic 2,134 (0.8%). Hispanics and Latinos (of any race) 262,151 (95.8%). As of the census of 2000, 193,117 people, 50,740 households, and 43,433 families resided in the county. The county gained 57,000 additional residents between 2000 and 2010. The population density was 58 people per square mile (22/km²). The 55,206 housing units averaged 16 per square mile (6/km²). The racial makeup of the county was 82.16% White, 0.37% Black or African American, 0.47% Native American, 0.43% Asian, 0.02% Pacific Islander, 14.00% from other races, and 2.54% from two or more races. About 94% of the population was Hispanic or Latino of any race. Of the 50,740 households, 53.20% had children under the age of 18 living with them, 62.60% were married couples living together, 18.30% had a female householder with no husband present, and 14.40% were not families; 12.40% of all households were made up of individuals and 5.10% had someone living alone who was 65 years of age or older. The average household size was 3.75 and the average family size was 4.10. In the county, the population was distributed as 36.20% under the age of 18, 11.40% from 18 to 24, 29.30% from 25 to 44, 15.60% from 45 to 64, and 7.60% who were 65 years of age or older. The median age was 26 years. For every 100 females, there were 92.90 males. For every 100 females age 18 and over, there were 87.90 males. The median income for a household in the county was $28,100, and for a family was $29,394. Males had a median income of $23,618 versus $19,018 for females. The per capita income for the county was $10,759. About 26.70% of families and 31.20% of the population were below the poverty line, including 39.40% of those under age 18 and 26.90% of those age 65 or over. Like all Texas counties, Webb County is governed by four part-time county commissioners paid $76,220 annually and elected by single-member districts of equivalent population, and a county-wide county judge, who is the full-time administrator of the county. County judge Danny Valdez left the position after two terms on December 31, 2014, and was succeeded by Tano Tijerina, a former professional baseball player and local businessman. Valdez narrowly defeated Tijerina in 2010, but Tijerina rebounded with a 65 to 35% victory over Valdez in the Democratic primary election held on March 4, 2014. The private prison operator GEO Group runs the Rio Grande Detention Center in Webb County, which opened in 2008 and holds a maximum of 1900 federal detainees. On March 27, 2017, the Laredo attorney Victor G. Villarreal was named judge of Position 2 of the Webb County Court at Law. He succeeds Jesus "Chuy" Garza, a popular veteran judge who resigned after indictment on an influence peddling charge. The commissioners interviewed six candidates for the position before deciding on Villarreal. Meanwhile, jury selection for Garza's trial is scheduled to begin on October 2, 2017. The indictment alleges that Garza in 2015 sought a $3,000 loan from Shirley Mathis on behalf of Christopher Casarez, a coordinator in Garza’s court. Casarez committed suicide in December 2016 the day before being scheduled to meet with authorities about the probe into the Garza case. On April 26, 2017, the Federal Bureau of Investigation conducted raids on municipal and county offices in Laredo to seek information in an undisclosed public corruption probe. Mayor Pete Saenz called the raids "embarrassing," but welcomed the investigation to halt any corruption that may be uncovered. A raid was conducted on Dannenbaum Engineering Company, a firm that holds large contracts in Laredo, San Antonio, and other Texas cities. Webb County Judge Tano Tijerina, who like Saenz indicated that he does not know the details of the matter, said that local officials would be standing for "justice, transparency and truth" and would cooperate fully with the FBI in the probes. County Commissioner John Galo said he was not surprised at the developments, which essentially closed off Laredo City Hall for the day: “Corruption in Webb County has been going on for too long,” Galo added. This seat will have changed hands four times in four years when the new commissioner takes office on January 1, 2017. Democratic voters in Precinct 1 named Jesse Gonzalez the new commissioner in the runoff election held on May 24, 2016. Gonzalez polled 2,330 votes (50.5 percent) to Esteban Rangel's 2,284 (49.5 percent). Rangel called for a recount of the tabulation. No Republican filed for the seat in heavily Democratic south Webb County. Francisco J. "Frank" Sciaraffa (born 1972), the departing commissioner, had been returned to the body in a special election held on November 4, 2014, in conjunction with the regular general elections held across Texas and the nation. He succeeded Linda Ramirez, an interim appointee who had been selected by presiding Judge David Peeples, a Republican member of the Texas 4th Administrative Judicial Region, a 22-county area in and around San Antonio. Sciaraffa invited Anna Laura Cavazos Ramirez, the former county attorney, to become his administrative aide. Linda Ramirez had succeeded Mike Montemayor, who resigned on June 20, 2014, after 17 months in office. Montemayor pleaded guilty on June 19, 2014, in a plea bargain to accepting some $11,000 in cash and $2,700 in electronics from a businessman, who unbeknownst to Montemayor, was an undercover agent of the Federal Bureau of Investigation. Montemayor defeated Sciaraffa in 2012 and took office on January 1, 2013. He faced a two-count indictment for having solicited and accepted bribes in exchange for promises to perform various official acts for private gain. He allegedly accepted a truck valued at $37,000 in exchange for promising to find government jobs to the owner of the vehicle, as well as the man's wife. The government elected not to proceed with that charge after Montemayor pleaded guilty to the other count against him. Had he been convicted on both counts in the U.S. District Court for the Southern District of Texas, Montemayor could have faced up to ten years in prison and fines of $500,000 on both bribery charges. After he posted bail, Montemayor said on Facebook, "there is more to the story, a lot more" than has yet been revealed. Montemayor added that he has "a great team of attorneys", but cannot discuss the specifics of the case in public. Meanwhile, a county resident, Juan Avila, in a public meeting on March 24, called upon the commissioners court to remove Montemayor from office. Under state law, a resident may file a written petition for removal with a district court judge. Avila told the commissioners, "It is true that you're innocent until proven guilty. But when the FBI comes and picks you up, that's a whole different matter." County attorney Marco Montemayor (no relation to Mike Montemayor), who in 2012 unseated Anna Laura Cavazos Ramirez, proposed that Mike Montemayor be suspended and denied his pay pending a hearing set for July 1 before Judge Peeples in the 49th District Court. Montemayor agreed to accept the suspension and the loss of pay, considering chaotic events which occurred at his most recent commissioners court meeting. Twenty-four applied for the post, including former commissioner Sciaraffa and former County Judge Louis H. Bruni. In April 2014, prosecutors claimed that Montemayor pocketed thousands of dollars in campaign contributions, accepted all-expense paid trips, sought to have traffic tickets dismissed in exchange for favors, and lived outside his precinct when he filed for office. Former County Judge Danny Valdez, who was unseated in 2014, reappointed Linda Ramirez, a United South High School teacher, as interim commissioner. However, the Webb County Democratic Party in early August 2014, in a 9/13 vote of its precinct chairmen, endorsed Sciaraffa to return to the seat that he had held prior to having been unseated in 2012 by Montemayor. Ramirez did not receive a single vote among the precinct chairs. On November 4, 2014 Sciaraffa defeated his lone opponent, a member of the Green Party. The special election was required under the Texas election code because Ramirez joined the court 137 days prior to the general election. The law would have allowed her to have served through 2015 without facing voters only if her assumption of the position had begun no more than seventy-four days before the general election. Meanwhile, Sciaraffa faces mounting legal problems. In 2012, Sara Jo Davila filed suit against Webb County and Sciaraffa after she was removed from her position as a community center director. Davila claimed that she had been forced to perform sexual acts on Sciaraffa to keep her position. In March 2013, Sciaraffa, after having first denied specific sexual encounters with Davila, admitted to contact but claimed the relations were consensual. Since that time there was little court movement in the case. County auditor Leo Flores said that taxpayers have funded nearly $90,000 to defend Sciaraffa in the Davila lawsuit. The fees were paid to the San Antonio firm Goode, Casseb, Jones, Riklin, Cholate & Watson. Additional amounts beyond the $90,000 are deferred to the county's insurer, Flores said. On September 23, 2014, Judge Diana Saldaña of the United States District Court for the Southern District of Texas threw out one of the claims against Sciaraffa but permitted the other to go to trial. Saldaña said that she found no proof that Sara Jo Davila sustained alleged tangible employment actions because of her rejection of Sciaraffa's sexual advances. However, she said Webb County may have failed to take needed precautions to prevent sexual harassment from occurring in the workplace. The judge said that she needs additional detailed information from Davila before she can rule on alleged acts of retaliation by Sciaraffa. On January 26, 2015, Montemayor was sentenced to seventy-six months in prison and fined $109,000. Taken into immediate custody upon sentencing, he said that he was "embarrassed by my actions and have been humiliated." He further apologized to the city and county "for going against everything I promised I would do." U.S. District Judge Marina Garcia Marmolejo also ordered Montemayor to undergo treatment for alcohol/drug abuse and to participate in a mental health program. Precinct 2, Rosaura Palacios Tijerina, known as "Wawi" Tijerina, was elected in 2006, 2010, and on March 4, 2014. In her last two Democratic primary contests, she defeated former commissioner Judith Gutierrez. A graduate of the Thurgood Marshall School of Law at Texas Southern University in Houston, Tijerina was from 1998 to 2002 the elected part-time Laredo city judge and from 1989 to 2008 an instructor of criminal justice at Laredo Community College, from which she received an associate degree in 1978. She is also a practicing attorney in Laredo. Her Precinct 2 includes a part of mid-Laredo and also encompasses the largest rural areas of Webb County: Aguilares, Mirando City, Oilton, and Bruni. Tijerina's husband, Omar Tijerina, Sr., is an uncle of Webb County Judge Tano Tijerina, under whom she will serve beginning on January 1, 2015. Precinct 3, John Clifford Galo, was first elected in 2012 to succeed Jerry Garza, who ran unsuccessfully for the Texas House of Representatives against Tracy King in House District 80 and in 2014 was an unsuccessful candidate for mayor of Laredo, having been defeated by Pete Saenz. Galo is a former two-term member of the Laredo City Council and an unsuccessful candidate for mayor in the 2006 election; he was defeated by Raúl González Salinas, Saenz's predecessor. In 2014, Salinas lost a bid for Webb County treasurer against the three-term incumbent Delia Perales. Salinas was succeeded on November 12, 2014, as mayor by Pete Saenz, a former member and president of the trustees of Laredo Community College. Precinct 4, Jaime Alberto Canales, was first elected in 2010. A former science educator and school principal, Canales won his runoff election for a second term as commissioner on May 27, 2014. He defeated fellow Democrat Jose Valdez, Jr., a former member of the Laredo City Council. In a low-turnout contest, Canales polled 1,963 votes (53.8 percent); Valdez, 1,683 (46.2 percent). In the March 4 primary election, Canales garnered 46 percent; Valdez, 30 percent. Arnulfo "Fito" Santos, Sr. (1931-2015), was the Precinct 4 commissioner for four terms from 1978 to 1984. A 1949 graduate of Martin High School in Laredo, he operated until its closure early in the 21st century, his family-owned, Alfredo Santos Grocery Store at 1900 Santa Maria Avenue, now the site of a Family Dollar store. Ricardo Rangel was from 2002 to 2014 the justice of the peace for Precinct 2, Place 2. He won the March 4, 2014, Democratic primary for a fourth term. On September 4, 2014, Rangel pleaded guilty to an extortion charge before U. S. District Judge Diana Saldaña. He has since entered an alcohol rehabilitation unit in Houston. Webb County is overwhelmingly Democratic and has voted for that party's electors since 1916 (the last Republican being incumbent President William Howard Taft in 1912). Although Texas as a whole voted for Republican nominee John McCain in the 2008 presidential election, Democrat Barack Obama won 33,435 votes (71%) of the ballots in Webb County. McCain was a distant second in Webb County with 13,111 votes (28%). Obama fared better than Democrat John Kerry had done in 2004. Latinos in Texas gave Obama 63% of their ballots, whereas Kerry had polled 50% among that group in Texas. In Webb County, Kerry received 23,654 (57%) to George W. Bush's 17,753 (42%). Nearly 57,000 registered voters in Webb County did not cast ballots in the 2008 presidential election. In 2012, despite the continuing statewide Republican trend, Webb County rebuffed Mitt Romney and cast an even larger percentage of its vote for President Obama than it had done in 2008. Webb County also voted in 2008 and 2012 for the Democratic nominees for the United States Senate, State Representative Rick Noriega of Houston, who failed to unseat Republican incumbent John Cornyn, and then Paul Sadler, a former state representative from Henderson, who lost to Republican nominee Ted Cruz for the right to succeed the retiring Kay Bailey Hutchison. Because of the heavy Democratic allegiance in Webb County, Republicans virtually never offer candidates for county office. In the March 4, 2014, primary, 1,151 (4.6 percent) voted in the Republican primary in Webb County, compared to 23,958 (95.4 percent) in the Democratic contests. Webb County elections administrator Carlos Villarreal reported a 24% turnout in the November 4, 2014, general election in Webb County. County officials have requested that Villarreal develop a plan to increase turnout for 2016. County Democratic Chairman Alberto Torres, Jr., suggested improvements in the election division website with clear maps of voter boundaries. Torres said that such better services might motivate persons to vote regularly. Prior to 1994, Webb CISD served only Bruni and Oilton. Mirando City Independent School District served the community of Mirando City from 1923 to 2005. Prior to 1994, all Mirando City children attended Mirando City ISD schools. After the spring of 1994, Mirando City High School closed. Therefore, from the fall of 1994 to July 1, 2005, WCISD served high schoolers from Mirando City, while Mirando Elementary School in the Mirando City ISD served pupils from kindergarten through eighth grade. On May 9, 2005, the Texas Education Agency ordered the closure of Mirando City ISD. The district closed on July 1, 2005, and all students were rezoned to Webb CISD schools. The private Holding Institute is a former United Methodist boarding school operating as a downtown Laredo community center. The Webb County Appraisal District Office in Laredo appraises taxable real property for municipal and county governments, Laredo Community College, and both public school districts. Opuntia cacti abound throughout much of Webb County. The Cactus Jack Ranch in northwestern Webb County is named for U.S. President Franklin D. Roosevelt's first vice president, John Nance Garner of Uvalde. Imported saguaro cacti are planted at the gate. This abandoned building along U.S. Route 83 in northwestern Webb County reflects the isolation of the South Texas ranch country. ^ a b "State & County QuickFacts". United States Census Bureau. Archived from the original on July 22, 2011. Retrieved December 29, 2013. ^ "James Webb (1792-1856) - Find A Grave Memorial". www.findagrave.com. Archived from the original on March 16, 2018. Retrieved May 6, 2018. ^ "2010 Census Gazetteer Files". United States Census Bureau. August 22, 2012. Archived from the original on April 19, 2015. Retrieved May 12, 2015. ^ "Texas Almanac: Population History of Counties from 1850–2010" (PDF). Texas Almanac. Archived (PDF) from the original on February 26, 2015. Retrieved May 12, 2015. ^ "QuickFacts. Webb County, Texas". United States Census Bureau. Retrieved December 16, 2018. ^ "Final primary election results released". Laredo Morning Times. Retrieved March 5, 2014. ^ "Rio Grande Detention Center". GEO Group. Archived from the original on July 22, 2016. Retrieved July 30, 2016. ^ Julia Wallace (March 27, 2017). "Victor Villarreal appointed as Webb County Court judge". Laredo Morning Times. Archived from the original on March 30, 2017. Retrieved March 31, 2017. ^ Taryn Walters (March 30, 2017). "Trial date set for judge accused of soliciting $3K loan: Jury selection to commence on Oct. 2". Laredo Morning Times. Archived from the original on March 31, 2017. Retrieved March 31, 2017. ^ "Laredo mayor calls FBI raids 'embarrassing'". The Laredo Morning Times. April 27, 2017. Archived from the original on April 27, 2017. Retrieved April 28, 2017. ^ "Primary runoff election results in Webb County". Laredo Morning Times. May 24, 2016. Retrieved May 27, 2016. ^ "Rangel asks for recount in county commissioner race". Laredo Morning Times. May 26, 2016. Retrieved May 27, 2016. ^ Philip Balli. "Commissioner Mike Montemayor pleads guilty to bribery". Laredo Morning Times. Retrieved June 19, 2014. ^ "Aldo Amato, County resident to petition for commissioner's resignation, March 24, 2014". Laredo Morning Times. Retrieved March 25, 2014. ^ "Biographical History". webbcountytx.gov. Archived from the original on March 20, 2014. Retrieved March 20, 2014. ^ "Jaime Canales". webbcountytx.gov. Archived from the original on March 20, 2014. Retrieved March 20, 2014. ^ "2014 Democratic and Republican Party Primary Election Returns for Webb County". Texas Secretary of State. Archived from the original on March 20, 2014. Retrieved March 20, 2014. ^ Bogan, Jesse. "A school district counts its final days." San Antonio Express-News. May 9, 2005. 01A. Retrieved on April 11, 2009. Lambert, R.B. (2004). Hydrogeology of Webb County, Texas [Scientific Investigations Report 2004-5022]. Reston, VA: U.S. Department of the Interior, U.S. Geological Survey.